Gearing up for another summer season in Asbury Park. This is shaping up to be a great summer, and we can feel the vibe already! Let’s all be safe and be aware of everyone on the roads. This is an exciting part of the Transit Village designation and will include Green Acres space. This is an exciting part of the Transit Village designation and including Green Acres space. Tri City News: Main Street reconfiguration support! Dan Jacobson is in our corner! Thanks for sticking with this story and following it to the conclusion which was the resolution by city council to approve the NJDOT Main Street reconfiguration plan. 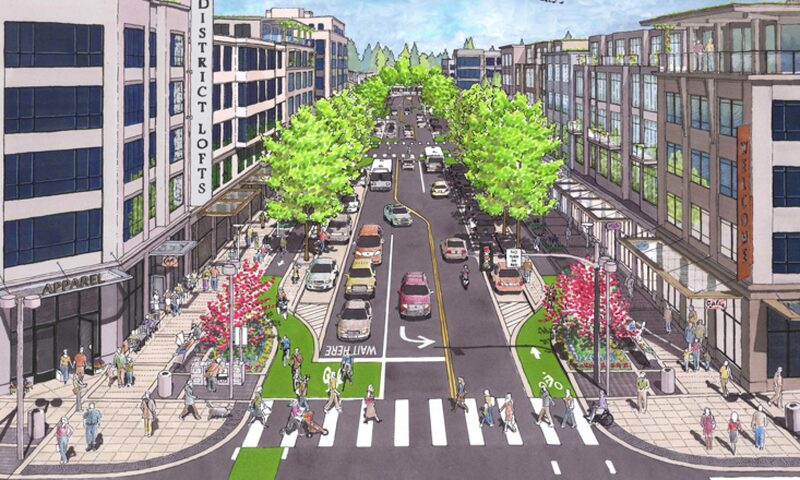 Main Street as we know it (and pictured above) will be made safer for everyone-walkers, bicyclists and drivers. NJDOT funds will cover the cost of improved design and infrastructure with a road diet consisting of one northbound lane, one southbound lane, a left turning lane, bike lanes and parking. Work is to begin at the end of this summer. Is infrastructure, or lack thereof sexist? Yes, yelling at female cyclists is sexist. Is infrastructure sexist too? While it isn’t universal that women have experienced the extent of jerk male bike rider behavior (aka sexism) described in this article, most (really, most-the data shows it) women who love to ride bikes are afraid. They’re not necessarily afraid of being yelled at or run off the road. They just don’t feel safe. Only the bravest and toughest female bike riders attempt to ride on the roads in NJ due to lack of, or non-existent infrastructure for bicycling. That leaves almost exclusively men on the road. This creates a culture of bike riding as a non-female-friendly activity, preventing women from riding their bikes. The APCSC table at the NJ Pride Festival was well-staffed by members of the group, and we all had great conversations about complete streets and our initiatives with the city. Thanks to those who stopped by to ask questions and learn about how infrastructure will make Asbury Park a world class destination and a wonderful place to live. AP obviously doesn’t need to build a beach on Main Street, but there are lots of other ways we can make our streets sticky! “A sticky street is a term coined by Netizen’s Brent Toderian, former director of City Planning in Vancouver B.C., a sticky street is simply one where human beings like to hang out. To walk on, bike on, sit at cafés and sip coffee on, do multiple errands and have multiple interactions on.